Kate Spade New York proudly presents its first-ever touchscreen smartwatch! A sophisticated choice, this golden scallop touchscreen smart watch with black leather strap provides effortless connectivity with a stylish array of touchscreen graphics. Kate Spade Scallop Smartwatch 2 Rose Gold Blush Leather with Touchscreen. Fully functioinal, gently used. No scratched on screen. 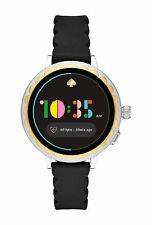 Kate Spade Ladies Scallop Touchscreen Smartwatch, New Open Box. Shipped with USPS First Class Package. Kate Spade New York proudly presents its first-ever touchscreen smartwatch! A sophisticated choice, this rose golden scallop touchscreen smart watch with blush beige Vachetta leather strap provides effortless connectivity with a stylish array of touchscreen graphics. Kate Spade New York proudly presents its first-ever touchscreen smartwatch! A sophisticated choice, this rose golden stainless steel scallop touchscreen smart watch provides effortless connectivity with a stylish array of touchscreen graphics. For sale is a Kate Spade Ladies Scallop Touchscreen Smartwatch. Band Material: Leather; Band Color: Vachetta; Case Size: 42 mm; Case Thickness: 9 mm; Water Resistance: IP67. Powered with Wear OS by Google, a trademark of Google LLC. Set it up with the app. This watch is in great working condition. Get at a great price. Don't miss out! I will do the best to answer them to the best of my ability. Kate Spade New York proudly presents its first-ever touchscreen smartwatch! A sophisticated choice, this two-tone silver and gold stainless steel scallop touchscreen smart watch provides effortless connectivity with a stylish array of touchscreen graphics. Kate Spade New York proudly presents its first-ever touchscreen smartwatch! A sophisticated choice, this silver stainless steel with golden scallop touchscreen smart watch with black silicone strap provides effortless connectivity with a stylish array of touchscreen graphics. NIB GORGEOUS "HOORAY" Mother of Pearl Dial, Gold with Luggage Leather Brown Strap. Sleep Monitor: Yes. Connectivity: Bluetooth® Smart Enabled / 4.1 Low Energy. Heart Rate: No. Battery Life: Up to 6 months Based on usage. Style # kst23204. New in original box, Kate Spade Holland Slim Black Leather Bracelet Hybrid Smart Watch. Style #KST23204. Connectivity with Bluetooth® Smart Enabled / 4.1 Low Energy. Black Leather Bracelet. Style #:KST2001. Kate Spade New York proudly presents its first-ever touchscreen smartwatch! the watch is iPhone® and Android™ compatible. Wear OS by Google works with phones running Android 4.4 (excluding Go edition) or iOS 9.3 . Style #:KST2006. kate spade new york proudly presents its first-ever touchscreen smartwatch! this smartwatch is iphone® and android™ compatible. Touchscreen: Yes. Strap Material: Silicone. See product insert for full details. Kate Spade New York - Scallop KST2008, Kate Spade Wearables. No need to sacrifice style or connectivity with the perfect feminine touchscreen smartwatch. With a scalloped gold-tone case and matte black leather strap, the watch is iPhone and Android compatible. Kate Spade New York Scallop Touchscreen Smartwatch, Rose Gold-tone Stainless Steel, Vachetta Leather Band, 42mm, KST2003. No need to sacrifice style or connectivity with the perfect feminine touchscreen smartwatch. Battery is working and the watch is running. Still has plastic casing over the watch face, so there are not scratches at all! First quality, perfect condition.